How did you spend your last six weeks? It’s been a bit of an extended absence from the Daughters because, well, we added a couple of Sons to the mix. You heard me. Sons. And nobody was more shocked about it than we were. But then on the morning of the nineteenth of March I got a text from Caroline’s husband that stopped me in my tracks and brought a sentimental tear to my eye: I am holding our son. And so Augie the boy baby was the first surprise. And then almost four weeks later on the fifteenth of April, along came the second: Freddie the boy baby. I knew something was up when the doctor exclaimed during delivery “Ooh, you’re a lot bigger than your sister was.” (She wasn’t joking – 55cm and 3.97kg). I never specified largeness in my baby odds, but as a particularly small human myself I didn’t feel I needed to. He is a big boy and I am a small girl – the concept floored me, and floors me still. In all fairness, his hair is auburn so he falls somewhere in between Less Likely and Practically Impossible on the likelihood scale and combining that with his unmistakably pointy chin and bowed lips, I can be assured that Frederick Francis Constable is indeed flesh of my flesh. And I adore him. 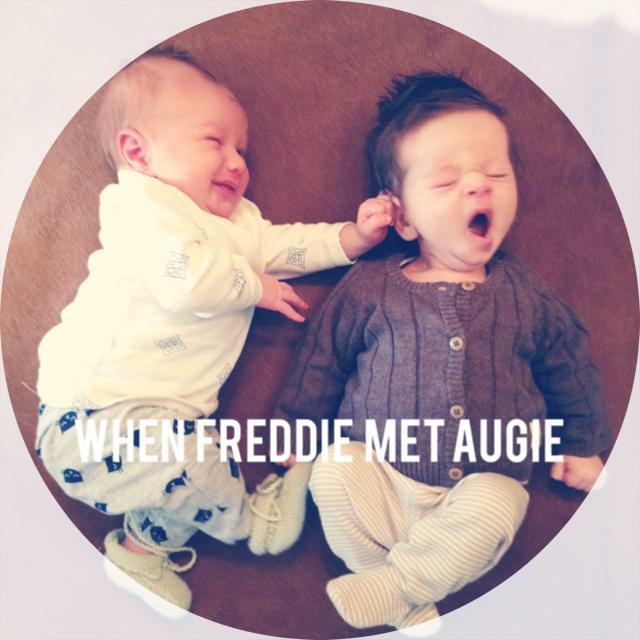 So the adventures of Augie and Freddie begin. Won’t you follow along with us? We promise not to keep you waiting so long again. This entry was posted in Birth, Parenting. Bookmark the permalink.